Born to a strong Catholic Welsh family. Joined the Franciscans in Greenwich, England. When his monastery was dissolved in 1559, he travelled to France to study. Ordained at Rheims, France. John returned to England to work with Catholic prisoners at Marshalsea Prison in London. He was arrested for being a priest and imprisoned at Wisbech Castle, but escaped to the Continent. He lived for a while at Pontoise, France, and then the Ara Coeli Franciscan Observant house at Rome, Italy, finally returning to England as a missioner 1592. He worked in several places in the country, and was elected Franciscan provincial of England. Arrested and tortured by the priest-catcher Topcliffe in 1596. Imprisoned for two years, doing time with Blessed John Rigby. Convicted on 3 July 1598 for the treason of being a Catholic priest. His execution took place early in the morning to reduce the chance of a mob; the executioner, roused out of bed for the job, forgot his ropes. During the delay while he went for them, John preached to the crowd that had gathered, and explained he was being murdered for his faith, not any disloyalty to his country. One of the Forty Martyrs of England and Wales. Acts 17:5-9 says that Saint Paul the Apostle stayed at Jason's home in Thessalonica, and he is mentioned in Romans 16:21. Legend says he was bishop of Tarsus in Cilicia, and evangelized the Greek island of Corfu. While imprisoned for preaching the faith, he helped convert the Martyrs of Corfu. Martyr. Florentine nobility; part of the Visdomini family. His brother Hugh was murdered; John tracked down the killer, finding him on a Good Friday. John received a vision of Christ on the Cross, which he took as a sign to pardon the killer, and convert to Christianity. He did both. Against his family opposition, he became a Benedictine monk at the San Miniato del Monte monastery. Founded and built by hand the monastery in Vallombrosa, Italy in 1038. The rule of John's order was an austere form of the Benedictine Rule, included an order of lay brothers, and received papal approval in 1070. When it seemed he would be appointed abbot, John fled. He founded abbeys at at San Salvi, Moscetta, Rozzuolo, Monte Salario, and Passignano, though did not do all the construction himself. Reported to have the gift of prophecy. Known for his great charity. Claims of miracles throughout his intercession in life and after. Lifelong layman in the diocese of Bayeux-Liseux, France. Son of an army officer. Watchmaker. Married to Blessed Marie-Azelie Guérin Martin on 12 July 1858. Father of nine children; five of them, all girls, survived to adulthood and became nuns; the youngest was Saint Therese of Lisieux. In 1889 he suffered two paralyzing strokes followed by a complete mental collapse, and was hospitalized for three years. Lifelong lay woman. Lace maker. Married to Blessed Louis Martin on 12 July 1858. Mother of nine children; five of them, all girls, survived to adulthood and became nuns; the youngest was Saint Therese of Lisieux. When Christ fell on his way to the Golgotha, a woman wiped his face with a towel; an image of Christ remained on the towel. This woman was Veronica; this incident is all we really know about her, and the relic has become her symbol ever since. Raised in a pious family. Joined the Dominicans in 1780. Priest. Missionary to the Philippines, and then Vietnam where he worked for nearly 50 years. Apostolic vicar and of East Tonkin (in modern Vietnam) and titular bishop of Metellopolis on 11 February 1794. He and several of his Dominican brothers ttried to escape the persecution of Christians by living in a cave, but they were betrayed and arrested on 13 May 1838. He was locked in a cage, put on public display for ridicule and abuse, and left to die of hunger, thirst and exposure. Martyr. Benedictine monk at the monastery of the Holy Trinity in La Cava de Tirreni at Salerno, Italy. Spiritual student of Saint Alferius who chose him as the second abbot of Cava in 1050; he served for 29 years. Known for his care and charity to the poor, often going off into the woods to collect firewood for them. Received the support and protection of the house and local people from Duke Gisulf II of Salerno, and praise from Pope Gregory VII. Born to the 10th century Iberian nobility. Married layman, and outstanding military commander. Father of Saint Euthymius the Illuminator. With his wife's approval, he became a monk on Mount Olympus in Bithynia. Travelled to Constantinople to his son, who was being held hostage by the emperor. Euthymius then joined his father as a monk. Their holiness attracted would-be followers, so they retired to the monastery of Saint Athanasius on Mount Athos in Macedonia. With John's brother-in-law, retired general John Thornikos, and Euthymius, John founded Iviron (Iweron) monastery on Mount Athos; Saint John served as its first abbot. The monastery is still in use, though now by Greek Orthodox monks. Sacramentine nun, making her profession on 4 November 1783. Martyred in the French Revolution. Raised in a Christian family. Married lay woman in the apostolic vicariate of West Tonkin (in modern Vietnam). Mother. Imprisoned, tortured and martyred in the persecutions of Thieu Tri for the crime of hiding a priest. Benedictine monk at the monastery of Saint-Wandrille in Fontenelle, Rouen, Normandy (in modern France). Priest. He received permission to live as a hermit, and lived locked in a cell near the abbey. Prolific copyist of the writings of the Fathers of the Church. Taught mathematics and calligraphy. Pilgrim to Rome during the papacy of Pope Hadrian I. Disciple of Saint Mark the Evangelist. First bishop of Aquileia in northern Italy, appointed by Mark. Martyred with Saint Fortunatus in the persecution of Nero. Cistercian nun. Martyred in the French Revolution. Priest in the apostolic vicariate of West Tonkin (in modern Vietnam). Imprisoned for six months in the persecutions of Thieu Tri, and repeatedly order to renounce his faith; Father Phêrô refused. Martyr. Ursuline nun. Martyred in the French Revolution. Sacramentine nun. Martyred in the French Revolution. First bishop of Lucca, Tuscany, Italy. Legend says he was sent there by Saint Peter the Apostle. Martyred with a priest, deacon, and soldier whose names have not come down to us. First century deacon, serving Saint Hermagorus of Aquileia. Martyred with Saint Hermagorus in the persecution of Nero. Eleventh-century Cistercian monk in Morimond Abbey, Parnoy-en-Bassigny, France. Abbot of Clairfontaine Abbey in Belgium. Abbot of Morimond Abbey. 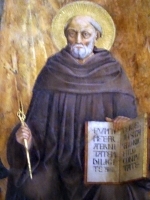 Abbot of the Cîteaux Abbey in Saint-Nicolas-lès-Cîteaux, France from 1155 to 1161. In 1161 he retired from leadership to spend retirement as a prayerful monk at the Morimond Abbey. Shepherd in the mountains of Carvagna in the Italian Alps. Poor as he was, he regularly gave away all he had to the church and those poorer than himself. Killed by a former employer who was jealous of Uguzo’s reputation and the admiration he received. Soldier in the imperial Roman army. Martyred in the persecutions of Diocletian when the ranks were violently purged of Christians. Martyred in the persecutions of emperor Trajan and the governor Maximus. Seventh century bishop of Quimper in Brittany, (part of modern France). Monk at Prüm Abbey near Trier, Germany. Abbot of Saint-Hubert in the Ardennes. Abbot of Prüm Abbey in 860. Prüm was burned by Vikings in 882, but Ansbald managed to re-build. Monk at Saint Oyend, France. Archbishop of Lyons, France. Friend of Saint Avitus of Vienne. Bishop of Bologna, Italy from 540 until his death. Martyred by Goths led by Goterne. Christian soldier. Martyred for his faith, but the time and place of his death have been lost. Bishop of Bologna, Italy from c.450 until his death. Hermit at Ploermellac, Brittany, France. Spiritual student of Saint Guenole. Eight lay people, many them related to each other, who were martyred together.